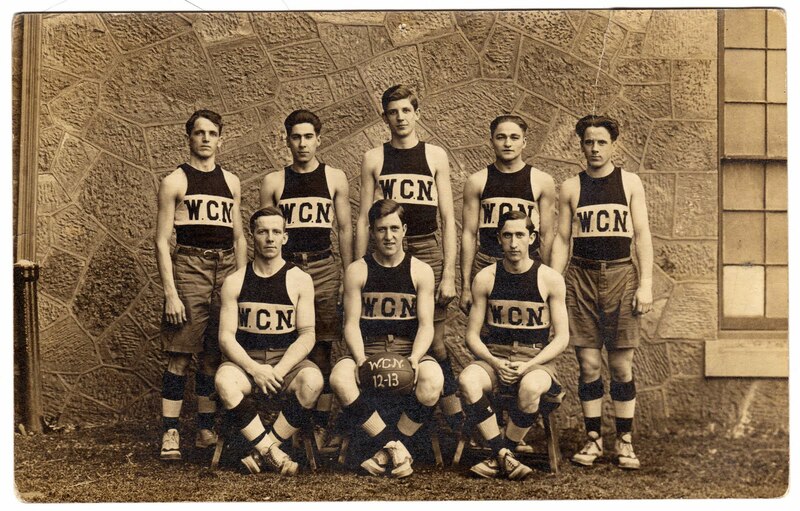 As March Madness continues1, here's a college basketball team from 98 years ago: the 1912-13 West Chester Normal School2 basketball squad. Under those names is the note: 'Westchester [sic] Normal Team I. Lost one game." This postcard belonged to my great-grandmother, Greta, who was a student at West Chester Normal School at the time and played on the women's basketball team. According to the history of kinesiology at West Chester, athletics played a key role at the college from 1871 onward. Gymnastics, wrestling and women's tennis were officially introduced in 1892, and they were followed by bicycling (1893), boxing and swimming (1894), and women's golf and men's basketball (1898). For more information on the Class of 1913 at West Chester Normal School, you can check out the yearbook, called "The Serpentine", which is offered here in several formats. The editor-in-chief of that yearbook was the aforementioned Frank Finnegan, who clearly was a multitalented fellow. And Morgan Ruth was one of the assistant editors. 1. I didn't fill out an entire bracket. But, before the tournament began, I predicted a Final Four of Kansas, North Carolina, Florida and San Diego State, with Kansas defeating San Diego State in the finals. 2. Some school history, from Wikipedia: "[West Chester University] traces its roots to the private, state-aided school that existed from 1812 to 1869. As the state began to take increasing responsibility for public education, the academy was transformed into West Chester Normal School, still privately owned and state certified. The normal school admitted its first class, consisting of 160 students, on September 25, 1871. In 1913, West Chester became the first of the normal schools to be owned outright by the Commonwealth of Pennsylvania." The college evolved into West Chester State Teachers College in 1927, West Chester State College in 1960, and, finally, West Chester University of Pennsylvania in 1983. 3. That's precisely what is written. "Albert" was written and then crossed through and replaced with "Morgan". 4. Again, that's precisely what it written: "Ted or Harry". Based upon what I've seen in the 1913 Serpentine yearbook, I believe "Harry" is his correct first name. I believe you'll find that most former "normal schools" later evolved into teachers' colleges. I'm not sure the origin of the term "normal school," but my understanding was always that these were to train folks to go on to teach.